As soon as I'm in charge, there will be no more venting of clothes dryers through the roof. I think the roof is a stupid spot to terminate clothes dryer vents because it's difficult to clean and it's a major contributor to ice dams. Clothes dryers should be vented through the side of the house, preferably within reach from the ground. When bath fans and clothes dryers vent through the roof, they melt a bunch of snow. 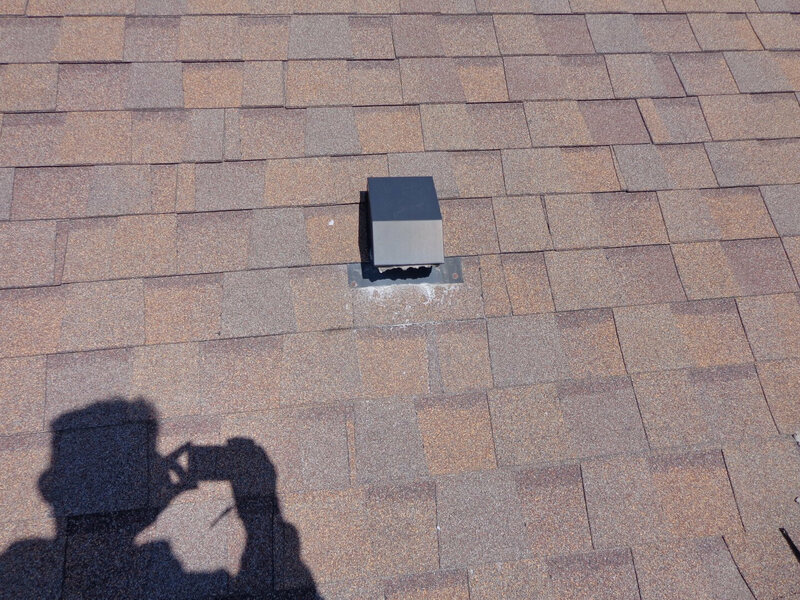 After the snow melts below the vent, it'll probably freeze again farther down on the roof. If this happens enough, an ice dam will form that's large enough to cause roof leaks. 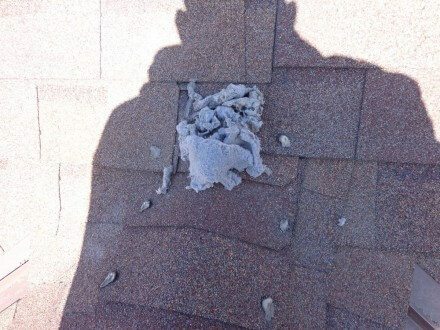 These areas of the roof are especially susceptible to roof leaks because there is no ice and water shield installed in these locations. I blogged about this earlier this year: Advanced Ice Dam Prevention. As I mentioned in my blog post about keeping your clothes dryer safe, the terminals for clothes dryers need to be cleaned on a regular basis. These terminals can get extremely dirty with lint over time, and eventually, the dampers get stuck open. Eventually, the terminal will get so filled with lint that air flow is obstructed, which will reduce the performance of the clothes dryer and could actually cause a fire. 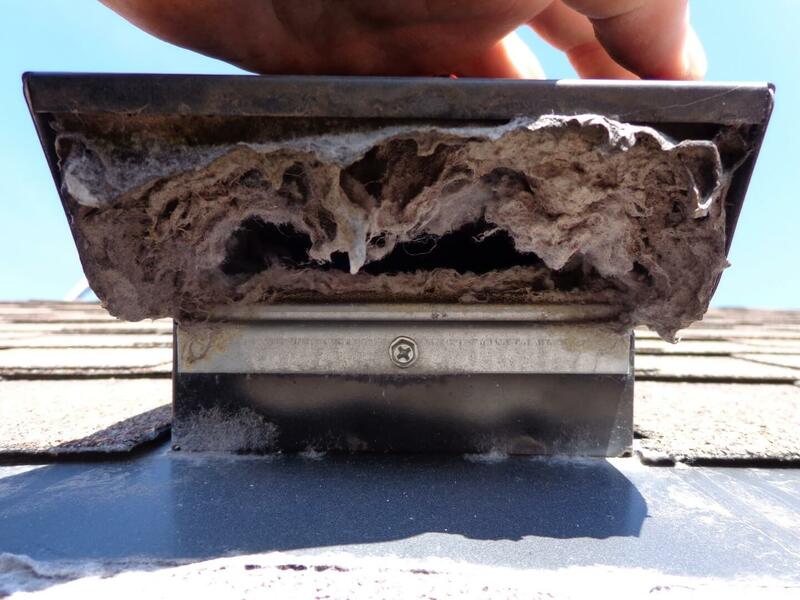 Cleaning the dryer terminal at old houses is usually a piece of cake; the lint can just be wiped off and pulled out by hand. The dryer terminal is easy to access at these houses because laundry rooms used to be installed in basements or on the first floor... but not any more. The standard for new two-story homes for nearly the last ten years has been to install the laundry room at the second floor. When that happens, where does the dryer duct go? Through the roof, of course. Most of the time. 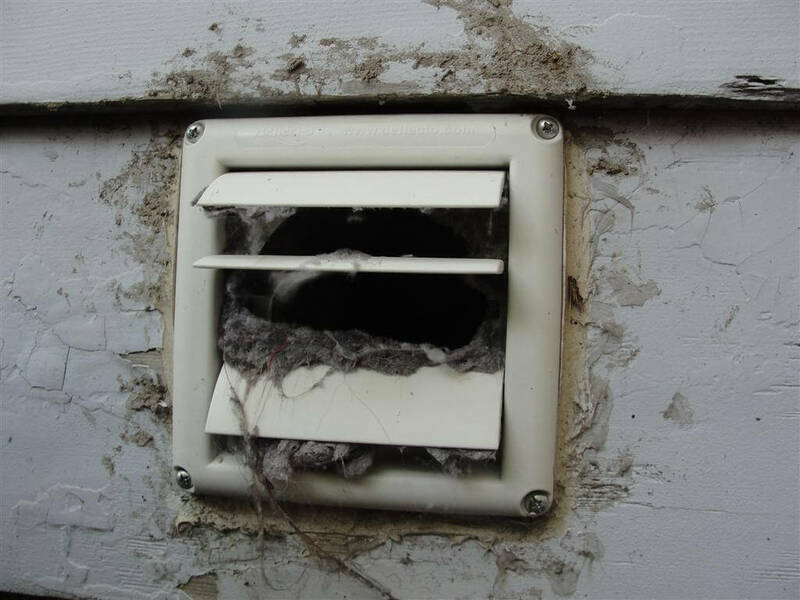 This arrangement will work fine at first, but just like dryer vents that go through the side of the house, the terminal will eventually get clogged with lint. The photos below are from a recent inspection of a 2007 built home in Plymouth that had a badly clogged dryer vent terminal at the roof. While I usually don't perform repairs or home maintenance chores at homes while I'm inspecting them, I couldn't help but pull some of the lint out. There was enough to start several campfires. 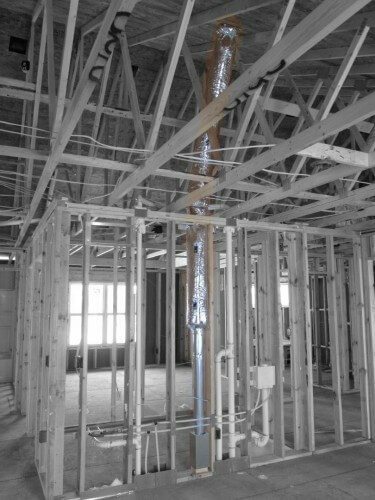 If you're having a home built, try to have your builder terminate the dryer duct at a location that makes sense. In my humble opinion, dryer vent terminals should be accessible from the ground. If you already have a home with a dryer that terminates at the roof, be sure to have the terminal cleaned on a regular basis, and consider having the terminal replaced with a DryerJack terminal. Get the extra clearance model 486. I don't have any personal experience with these, but I'm a fan of the company that makes them: In-O-Vate Dryer Products. They make a bunch of products designed to make clothes dryers perform better. I tested out their DryerFlex product a couple of years ago and blogged about it here: DryerFlex: A Superior Dryer Transition Duct.